Description Google AdWords is a form of advertising where a company, the advertiser, bids on keywords. If someone does a Google search for that keyword, the company's ad will show up on the right side of the screen. The position of the ad depends on the bid price and the quality of the keyword. The quality of the keyword is calculated by Google and depends on several factors. Basically, Google wants the ads to show what the user is searching for (the keyword). If the keyword and ads match, then Google is happy and the keyword gets a high quality ranking. If the person who typed in the keyword sees an interesting ad, he may click the ad. Each time an ad is clicked, the advertiser pays Google money. Clicking an ad takes you to a Web site that tries to sell you something. If you buy it, the company also makes money. Companies pick hundreds of keywords and design matching ads. This results in a lot of data on each keyword. Some keywords don't work out. Such keywords may get no clicks or get a lot of clicks but no conversions (sales). The company pays Google for each click. Periodically someone must decide which keywords should be retained and which should be retired. 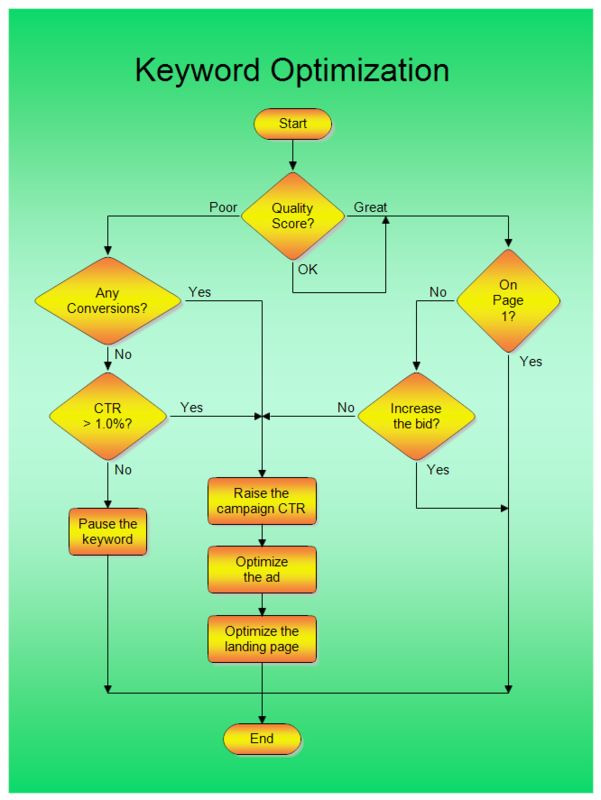 The flow chart above shows a possible algorithm to use in deciding what to do with a keyword. If the quality score of a keyword is OK or Great, and the ad is showing on page 1 of the search results, then everything is fine. This flow chart doesn't consider the position of the ad, but you could easily modify it. If the quality score of the keyword is Poor, then you have to decide what to do with the keyword and ad. If the keyword gets a lot of clicks but no conversions (sales), changes need to be made to the ad or landing page. A keyword with a Poor quality ranking, no sales, and few clicks should be paused or deleted. The advertiser needs to develop an algorithm like the flow chart shown above to decide what to do with each keyword. Drawing Instructions If you haven't already done so, first download the free trial version of RFFlow. It will allow you to open any flow chart and make modifications. Once RFFlow is installed, you can open the above flow chart in RFFlow by clicking on KeywordOptimization.flo. From there you can modify this sample flow chart for your needs. It is often easier to modify an existing chart than to draw it from scratch. To draw this flow chart without downloading it, run RFFlow, click on the More Shapes button , scroll and open the Flowcharting folder, click the Colored, Rounded Shapes stencil and click the Add Stencil button.